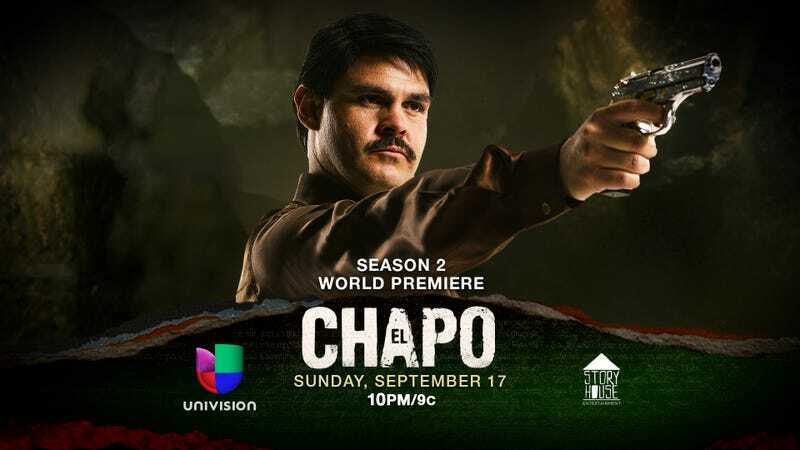 Univision and Story House Entertainment have announced that the 12-episode second season of the original series “El Chapo” will premiere Sunday, September 17 at 10 PM ET/PT on Univision Network. Season two kicks off with Chapo’s first prison break and goes on to reveal the critical role corrupt government officials play in aiding El Chapo’s rise over his rival cartel bosses. Viewers will also begin to see how his quest to become the leader of the Sinaloa Cartel, the most powerful criminal organization in the world, impacts the lives of those closest to him–including his family. Additionally, the series will continue to break boundaries by airing episodes with English subtitles, a first for the No. 1 Spanish-language network. “El Chapo” is the first co-production between Netflix and Story House Entertainment, the content development and production unit of Fusion Media Group (FMG). Season two will debut globally on Netflix at a later date to be announced. “Based on intense interest in this story, we are taking an unprecedented step to expand the reach of our breakout series ‘El Chapo’ by making it accessible with English subtitles on Univision Network. This move speaks to the uniqueness of a series that has captured the attention of audiences around the world–crossing borders, languages, and cultures–and allows us to extend it to U.S. viewers who seek out quality storytelling regardless of language” — Camila Jiménez Villa, co-president and chief content officer of Fusion Media Group. Over the course of three seasons, the ripped-from-the-headlines drama explores the life story of Joaquin “El Chapo” Guzman over a span of three decades–from 1985, when he was a low-level member of the Guadalajara Cartel, his rise to power as the leader of the Sinaloa Cartel and his ultimate downfall. The first season of the highly anticipated original series made its U.S. premiere on Univision Network in April. The suspenseful season one finale reached 3.5 million Total Viewers and reinforced Univision’s position as the No. 1 Spanish-language network. Netflix, which co-produced the series, is currently streaming the entire first season with English subtitles. ‘El Chapo’ is created by Silvana Aguirre Zegarra and Carlos Contreras and produced by Daniel Posada. The second season is directed by five talented directors from four countries: Ernesto Contreras (México), Carlos Moreno (Colombia), Hammudi Al-Rahmoun (Spain), Daniel and Diego Vega (Peru). Christian Gabela is the General Manager of Story House Entertainment. Story House Entertainment is a content development and production unit within Fusion Media Group (FMG). Launched by Univision Communications Inc. (UCI) in 2016 Story House Entertainment builds on Univision’s award-winning storytelling abilities by bringing to life stories and characters that are revealing, authentic and reflect the cultural diversity of America. The content development and production unit produces premium scripted and non-scripted programming in English and Spanish for UCI’s portfolio of owned networks as well as third party networks and platforms. Story House Entertainment utilizes its access to the news archives and award-winning journalists of Univision News to create programming that both informs and entertains. In its first year Story House has produced a series of documentaries including “Hate Rising” and “Residente” as well as the docu-series “Outpost,” which premiered during a limited-run on HBO followed by airings in English on FUSION TV and in Spanish on UniMás. The unit’s first scripted series “El Chapo” premiered in April 2017.